This paper outlines a nascent field of product innovation, which we believe will become significantly more relevant in the near future. Product design for mass individualisation is a new product design paradigm that comprises an open hardware platform and multiple modules that are integrated with the platform. It gives freedom to end users to integrate different modules into the platform as per their choice. Large manufacturers will produce the platform and some specific modules. Other modules will be invented and produced by smaller companies and by the user. This type of product integration will be engaged with by the all actors involved in the design and aims to help them to be more creative and innovative. Strategic and technological integration of all these actors, which is also the theme of Innovation 4.0, is the main focus of this work to intensify the innovation. Key areas which need to be focused on are identified and presented by an explorative study of existing product design and customisation approaches. Based on the explorative literature analysis, an industrial questionnaire survey has been conducted, and results are presented for the industrial implication and insights on this approach. 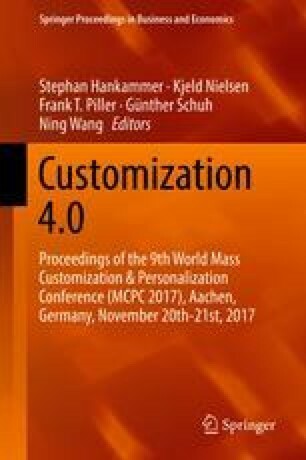 The findings clearly show that the end product from product design for mass individualisation will be more creative and innovative. The authors are grateful to all the participants for their time and response to the survey questionnaire. We highly appreciate the feedback on text questions which helped to gain many practical insights.